This is the first week of weekday breakfast offerings at Show Dogs, the Civic Center sausage emporium serving up meaty numbers of quality from Golden Gate Meats, 4505 Meats, Fatted Calf, and Let's Be Frank. 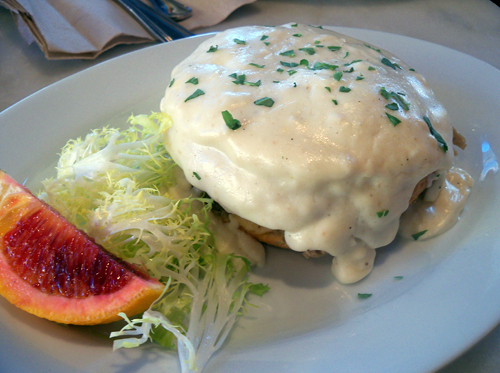 A breakfast at Show Dogs includes dishes and drinks priced from $4 to $12.95, and the food is from one of San Francisco's best cooking couples, Gayle Pirie and John Clark. 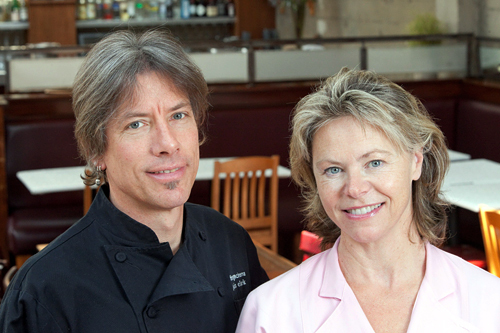 The couple resides in the East Bay and together have over two and a half decades of cooking experience including working as co-chefs at Zuni Café and being co-owners and chefs at Foreign Cinema. Their new breakfast menu—with Chef de Cuisine Seth Carter--is inspired by brunch at their ever-popular Foreign Cinema, and from their book, Country Egg, City Egg. Chef Pirie said via phone interview that when creating Show Dogs, she and Clark tried to “think of the history of Market Street and create a fine food emporium. [We wanted to] make it inclusive of all three meals, and had dinner, lunch and happy hour already.” Offering breakfast service at Show Dogs is “harkening back to the turn of the century, when you had food all day.” Brunch will launch on weekends soon -- view the full menu at showdogssf.com. Show Dogs morning fare is sophisticated yet comfortable, with fun twists on the Croque Madame (with succulent pulled pork, Gruyere & béchamel), pancakes (corn cakes with molasses syrup and apricot preserves spiked with Serrano chiles), and Huevos Rancheros (white beans, bacon, cheddar and tomatillo salsa). Sausage fans can indulge with the Sunrise ShowDog plate of maple bacon on a soft Acme bun, scrambled egg, piperade, arugula and a side of celery root hashers. Chef Pirie said she is “real partial to sausage with eggs,” making the Sunrise ShowDog plate her top pick. The house coffee is from Four Barrel. Belly up to an eye opener with a Lagunitas Espresso Stout, served warm. Other adult beverages include: Bloody Marys, Mimosas, or Bloody Beer. Fire-eaters can up the heat level on their food with hot sauce, provided on each table. Music includes Brazilian sambas and French jazz. The space is sun-filled and tidy, with wide window views of the unfolding morning activity. 1. Cook sausage in a fry pan or preferably, on a grill until browned on both sides and cooked through. 2. While sausage is cooking, melt 1 tablespoon butter in a small fry pan. 3. When butter is melted, sautee peppers and onions in butter until cooked through. 4. Add a splash of sherry vinegar and cook for another minute or so, then add a pinch of cayenne, salt and pepper. 5. Add the eggs, arugula and cheddar. 7. 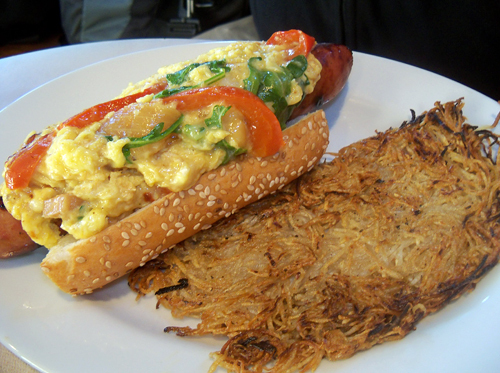 Place the cooked sausage in the hot dog bun and top with the scrambled egg mix. 8. Serve with your favorite hash browns or country potatoes. *For a bit more texture, toast the hot dog bun in a 350 degree oven for 3-4 minutes to crisp the outside.